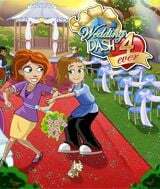 Download Wedding Dash 4 - Ever for free at FreeRide Games! In Wedding Dash 4-Ever, another exciting chapter in the successful Time Management series, Quinn - together with her faithful buddy Flo - runs her very own Wedding Planning Business, assisting couples on their happy day by coordinating and supervising the big event and taking care of all the little details to make sure it runs smoothly and without any hiccups. However, the drama begins in Wedding Dash 4-Ever when Quinn's mother turns up uninvited, announcing she's come to visit for a couple of weeks to help her dearest daughter plan for her very own wedding -especially since Quinn and Joe called off the wedding and 'forgot' to tell mother! Now Quinn has to juggle hiding her relationship status from her nosy mother, running her demanding business and keeping her mother from poking her nose where it doesn't belong! 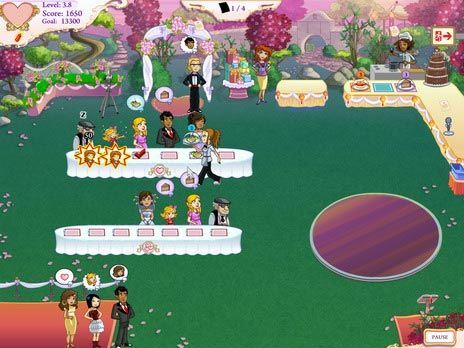 This Time Management game is spread across five romantic locations and will have you enjoy fun mini-games while trying to avoid wedding disasters like Bridezillas and wedding crashers. 5 trendy locations including a Greenhouse, a Vineyard, and a Lover's Promenade. 9 wedding day disasters including Bridezilla and Groom Kong and a Food Fight. 10 deluxe weddings: lead wedding ceremonies and conga lines.